20120323 +Up in the am and all out to work and school except G&I. We loaded up our supplies and tools and headed up to the Farm. G talked the whole way up to the farm and sang to his iTouch. 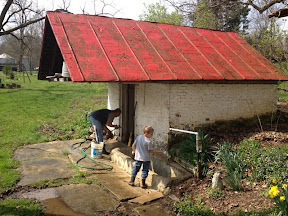 We got there and stopped to pick up some maple sap to freeze and then to the Farm to work on the spring tank plumbing. Dave stopped by for a quick sword fight, and GpaW helped us out. G really worked and carried things for me. He also feed the ponies many many treats. After lunch we walked around and reviewed some ideas and plans, and G got into some nettles that touched off a meltdown... We got him cleaned up and our supplies loaded and headed home. This gave G an opportunity to recharge. Home and we sort of hung out, watched basketball, cleaned out the car for vacation and had a quiet night. Up late with D watching basketball.